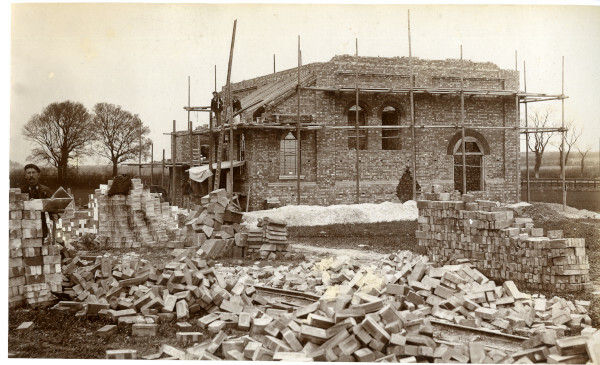 Sepia photograph of a partly constructed building that stands among piles of bricks. The building has most of the ground floor and first floors in place and is surrounded by scaffolding. Two men stand on the scaffolding and another stands beside a pile of bricks to the left of the picture. On the left of the picture is a group of eight workmen who stand or dig. The side of the building facing the camera has one large arched window and two smaller ones. See also 28, 29, 31, 32 and 141. In the original album there was a shorthand note above the photograph, "Gas Works".